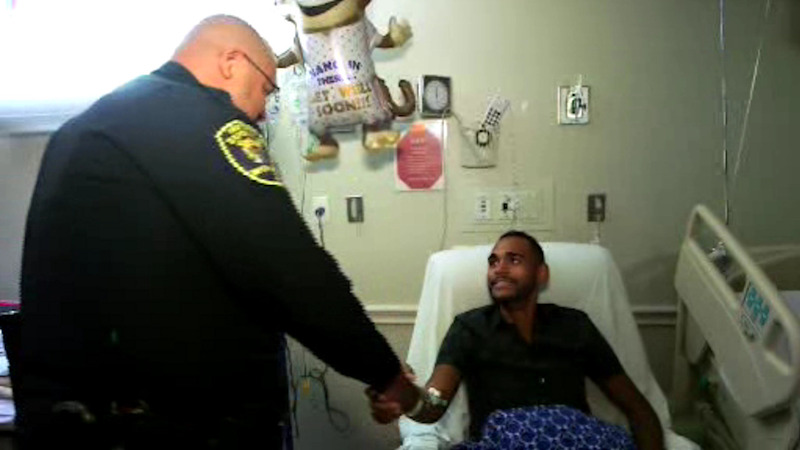 ORLANDO, Florida (WABC) -- Amid the overwhelming grief in Orlando this week, a survivor of the shooting was reunited with the police officer who rescued him from the nightclub on Thursday at an Orlando hospital. Angel Colon was at the Pulse Nightclub on Sunday when the shooting broke out. He was shot three times and quickly found himself on the floor and unable to move. That's when Eatonville Police Officer Omar Delgado was bravely able to pull Colon, who was critically-injured, through the carnage and outside to safety. They were reunited at Orlando Regional Medical Center where Colon has been recovering. This was the first time Colon had seen Officer Delgado since the shooting.